Love all things pumpkin? Can’t wait to get your eggnog on? Feeling divine about cranberry season coming up? Oh, this Lifeway Kefir review is so for you. Guys, they have new fall and holiday flavors! Flavors like PUMPKIN SPICE. EGGNOG. And CRANBERRY CRÈME BRÛLÉE. When the samples arrived at FBE HQ, it really did feel like Halloween, Thanksgiving and Christmas all in one. The weather is cooling down, and my desire to eat all things fall is at an all-time high. And, because I love to taste things (and can’t have my beloved wine right now due to my bun in the oven), I was excited to do a little kefir tasting in the comfort of my home. Before we get to flavor and consistency though, let’s talk nutritionals. ‘Cause we all want to know what we’re putting in our bodies, right? Right. All three have pretty similar nutritionals. Each one-cup serving has 140 calories, 2 grams of fat, 20 grams of sugar (boo!) and 11 grams of protein (yay!) with good amounts of vitamin D and calcium. While I’m not exactly sure what “eggnog flavor is,” the rest of the ingredients in these seem pretty good. And, they’re all gluten-free, 99 percent lactose-free and made with milk from grass-fed moo-moos. Eggnog, Pumpkin Spice and Cranberry Creme Brulee (in that order from left to right). And one of the best perks of kefir of any flavor? 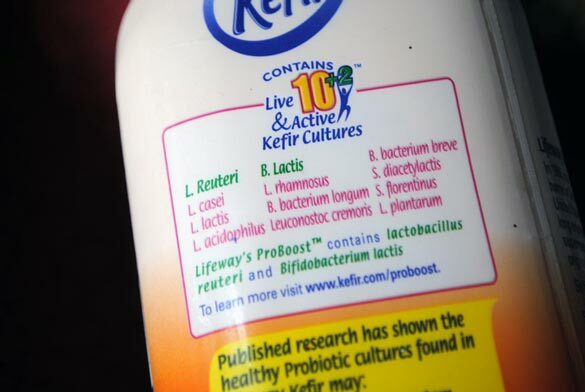 Probiotics! Okay, now let’s talk taste. If you’ve never had kefir before, it’s kind of like having thick, creamy, drinkable Greek yogurt. It’s definitely got some hip-tang to it (anyone else see that episode?). And these kefir flavors still have that tartness going on. With the 20 grams of sugar, I was expecting more of a sweet taste, but these are very subtle in their taste and flavor (read: it is not akin to, say, a PSL). This is more of kefir lightly flavored with eggnog, pumpkin spice and cranberry crème brûlée than a dessert drink. That said, once you know and expect that — and assuming you do like the tartness of kefir — it’s pretty darn tasty. Eggnog has just a hint of that beloved Christmas drink (and all of the creaminess! ), Pumpkin Spice tastes like kefir with a bit of real pumpkin pie filling, and Cranberry Crème Brûlée was surprisingly my favorite. (I was most excited for the Pumpkin Spice.) The cranberry paired really well with the natural tartness of the kefir and the creaminess suited the crème brûlée flavor well. 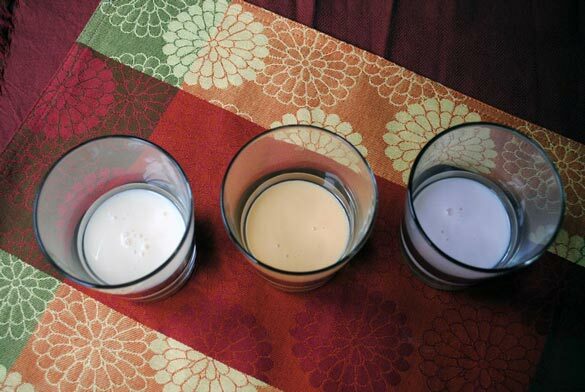 No flavor hits you over the head, and while I like my typical eggnog and other holiday drinks to be a bit more, well, intense in the flavor department, these were pretty good and could be subbed in for your everyday kefir drink — not as dessert.